The theme at TEDxSMU 2014 was Strangely Familiar. The Young Fellows, SMU's TEDx student ambassadors, were tasked with creating an interactive exhibit that represented our contribution to the lobby experience. We came up with the idea of a photo booth that took pictures of people with a part of speech they selected and injected their words and pictures into a program that generated TED talk titles. Four people enter the photo booth at a time. The screen in front prompts the users to write a part of speech, Mad-Libs style, on a whiteboard next to their seat. The user simply holds up the whiteboard, frames themselves, presses the button and smiles. A TV overhead displays a rewritten TED talk title with the new wacky, non-sensical words injected. The project challenged us to build something bigger than anything we had done before. The booth not only engages people by getting them to create "strangely familiar" potential TED talks, it also prompts idea sharing and drives additional engagement through the whiteboard backdrops to the booth. 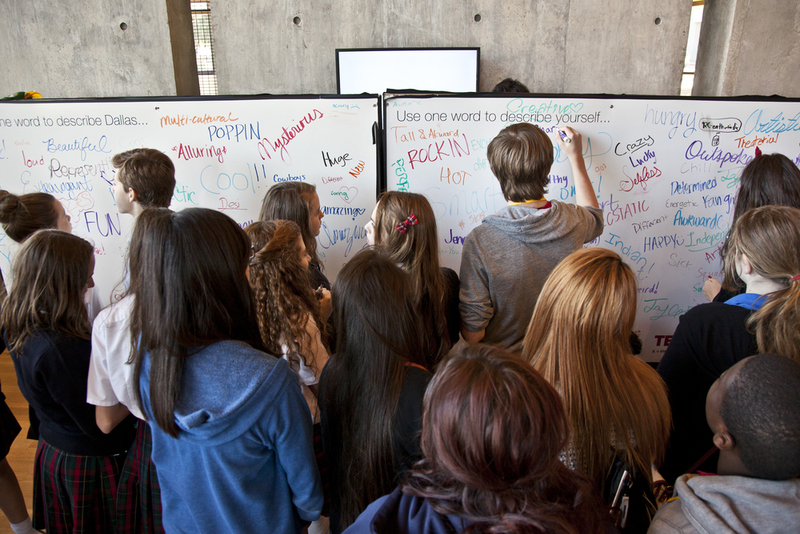 The two boards prompted people to "use one word to describe Dallas" and "use one word to describe yourself," each generating conversation, a hallmark of TED events. Throughout the two days of TEDxSMU and TEDxKids@SMU, well over 750 people engaged with our interactive piece.